Storm's 360GT Searchbait is the perfect swimbait lure with its rattling jighead. The design of this bait creates the ultimate natural presentation with it's boot tail which will initiate incredible action at every speed. 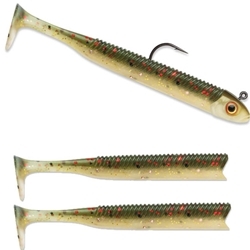 The 360GT is easy to rig with the entrance and exit holes indicated on each lure body. This go-to lure is 5.5" in length and 3/8oz in weight. Each package includes one jighead and three bodies.